The 'Warring States' period of Chinese history was triggered in 481 BC by the first division of the Jin state in the central and northern area of the imperial domains. The Chinese emperors had long governed a great many tribes and smaller kingdoms, all vassals, but all struggling against one another for regional superiority and even against the ruling emperor for dynastic supremacy (in fact the word for 'king' was the same as the word for 'emperor'). By the beginning of the fifth century BC the authority of the Middle Zhou emperors had reached a nadir. They were rapidly becoming little more than figureheads while the real power lay with the rulers of the various states - effectively independent kingdoms in their own right - which were often at war with their peers for supremacy within the empire. The Eastern Zhou continued to rule a much-reduced territory during the Late Zhou period in the face of opposition between as many as seven other kingdoms, one of which was the Qin state. This was elevated to the status of an independent kingdom under the reign of Huiwenwang (338-311 BC, with preceding rulers, the dukes, shown below in light grey text to differentiate them). Qin (pronounced 'chin') was the westernmost of the seven warring kingdoms during the Warring States period. It formed a wide north-south (defensive) barrier to the barbarian lands beyond, and bordered the kingdom of Zhao to the east. It had existed for some centuries already as a sub-state of the early Chinese kingdom, with Duke Huan of Qi leading the fight against barbarians during the early part of the Middle Zhou period. According to stories about their origins, the rulers of Qin were descendants of the Emperor Gaoyang of the Chinese Legendary Period in which an early Chinese state was first beginning to emerge. 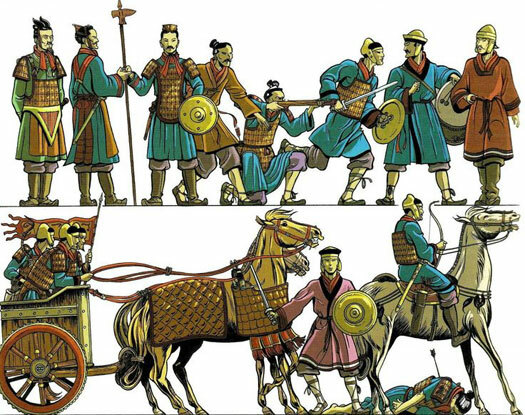 They loyally served the Shang emperors and then their successors, the Zhou, when Zao Fu of Qin presented a collection of chariots to the tenth century BC Emperor Mu Wang. Feizi, another Qin noble, was very famous for his cattle-breeding successes. Emperor Xiao Wang of Zhou entrusted him with the supervision of the royal herds. In order to strengthen ties between his family and the Zhou dynasty further, Feizi was granted the territory of Qin which came with the unenviable duty of serving as a shield against the wild nomad tribes of the west. Emperor Ping of the Eastern Zhou raised the Qin to the position of feudal lords in thanks for their unwavering support during the sacking of the empire's previous capital, giving birth to the duchy of Qin. The 'Partition of Jin' in the central and northern Zhou kingdom sees the gradual dismemberment of the powerful Jin state as its territory is sub-divided amongst family members. Divisions occur in 481 BC, 475 BC, and 468 BC, and result in the creation of the states of Han, Wei, and Zhao (from south to north). The process is completed in 403 BC, but the 'Warring States' period has already begun and the fracturing of China's early single kingdom is complete. The Eastern Zhou continue to rule a much-reduced territory during the Late Zhou period in the face of opposition from as many as six other kingdoms. Son of Duke Dao of Qin. Duke of Qin. Born around this date is Mo Di, popularly known as Mozi. He becomes a philosopher during the 'Hundred Schools of Thought period in 'Warring States' China later in the fifth century (he dies around 391 BC). Periods of deep instability in societies often result in a flourishing of monastic or philosophical thought (sixth century AD Britain is no different), and China's Hundred Schools of Thought period is seen as a golden age of philosophy for the country. The movement is built in no small part on the back of the work carried out by Confucius. Confucius dies having so far failed in his mission to bring virtuousness to the country's rulers and moral values to the method of their rule. It would be too early for him to see any sign of the growing philosophical movement that has been inspired by his work. The warring states continue to fight until well after the last of the Zhou have fallen, but the ideas that Confucius leaves behind are taken up by his disciples and eventually reach a much wider audience. Brother. Besieged by his ministers. Committed suicide. Grandson (his father predeceased Huai). Son of Huai, uncle of Ling. The three Jin states which had triggered the 'Warring States' period in the first place - Han, Wei, and Zhao - are officially recognised by Zhou Emperor Weillie Wang. The act effectively provides a closing bookend to the long-running 'Partion of Jin'. He organises them into feudal states so that they can act as a buffer between the core Zhou lands and the increasingly belligerent and independent-minded Qin - although at the moment the Qin technically remain an imperial subject. Unfortunately, all of the states are given a push by this act towards establishing themselves as kingdoms in their own right. The succession in the state of Qin becomes very unstable, and possibly has been for some decades. This allows the three successor states of Jin (Han, Wei, and Zhao) to dominate the political scene. In 385 BC, the infant Duke Chuzi is killed by the previously exiled Prince Shixi, son of Duke Ling of Qin, with the support of the minister. His corpse and that of his dowager duchess mother are thrown into a well. Son. Acceded aged 1. Killed by the exiled Xian. Son of Ling. Named Prince Shixi, usurped the title. Effectively a usurper duke, Xian has fortified many of Qin's towns and has transferred his seat to Liyang (near modern Lintong in Shaanxi province). He has brought the military to the forefront of local politics, organised all registered households in mutually-responsible groups of five, and ensured that markets and guilds are strictly controlled. The first fruits of these early reforms are to be seen now, when Duke Xian defeats the army of Jin at Shimen, executing 60,000 Jin troops. This is Qin's first recorded military excess, previous victories having been far more controlled. The other Chinese states have viewed Qin as a semi-barbarous state, situated in the west as it is, close to the nomadic barbarian tribes. Alliances with Qin have not been forthcoming for this very reason, along with Qin's military weakness until more recently. Having moved the Qin capital to Xianyang (in Shaanxi province), Xiao has also reorganised the legal system and the administrative districts, and now goes on to strike outwards, defeating the Wei kingdom in battle. Son. First king of Qin from 325-323 BC. The Zhou imperial state has existed for some years as an increasingly meaningless concept, with the states that form the majority of its territory showing increasing levels of independence in thought and deed. During this short period several of their leaders - in Han, Qin, and Yang - declare themselves to be kings of their states, no longer recognising imperial authority even nominally. The Qin kingdom conquers the independent Shu state which is located in the modern Sichuan province. For the first time, this act draws the Sichuan Basin into a 'Warring States' China that has previously been centred on the Yellow River. The Shu are appended to the Qin kingdom as a subsidiary territory. Son. Died following a serious injury. In the first seven years of his reign, Zhou Emperor Nan Wang has moved his capital into the duchy of West Zhou. Now Qin attacks Han and Chu comes to Han's defence. Zhou is nominally on the side of Qin, but Nan Wang has to resort to ever more desperate diplomatic intrigues to avoid being attacked by any of these former vassals. Towards the end of China's 'Warring States' period, by the third century BC, the Xiongnu become a real threat to the north-western Chinese border. By this time the Lesser Yuezhi, formerly reliable jade traders to the Chinese, are better known as reliable horse traders. Jade is still included in trade, however. The Zhou have long since lost any military power, but their political power has also faded sharply, leaving them as figureheads and bargaining tools. Even their surviving core territory at the heart of the old Chinese state has been divided, with the western section more recently providing the Qin with their capital at Wangcheng. Nan Wang has conducted a political game of survival, playing his opponents off against each other, and has survived for an astonishing fifty-nine years as the Eastern Zhou emperor. Now the Qin capture the city of Chengzhou, ending the Zhou dynasty. Nan Wang is deposed and executed. Son. Died 3 days after coronation (extreme age or poison). The city of Chengzhou has apparently not remained in Qin hands since 256 BC as it has since formed the capital of King Hui's East Zhou kingdom which claims the imperial title. Now the Qin capture the remaining Zhou territory of East Zhou and the so-called 'King Hui' is executed. The Zhou are no more and their lands are now controlled by the Qin. Chuang-hsing Wang is succeeded by Wang Chêng. In his time as the Wang dynasty's third ruler, he is the most feared leader, one who is regarded as a common threat by all the other kingdoms of the 'Warring States' period. His ruthless drive to unite China sees him conquer the others one by one (there are numerous tales of assassins sent to kill the king, one of which is depicted in the Chinese feature film, Hero / Ying Xiong.). He produces a contemporary super-army, a strongly regimented force with mass-produced bronze weapons that is expertly led. China has seen nothing like it. Son. King of Qin aged 9. Reunified China under his Qin dynasty. Seemingly within the last century, during the 'Warring States' period, the Greater Yuezhi have appeared on the sweeping grasslands closer to the border of the Qin kingdom, somewhat to the south of the Eastern Steppe, and possibly encompassing at least part of the western section of the Yellow River. 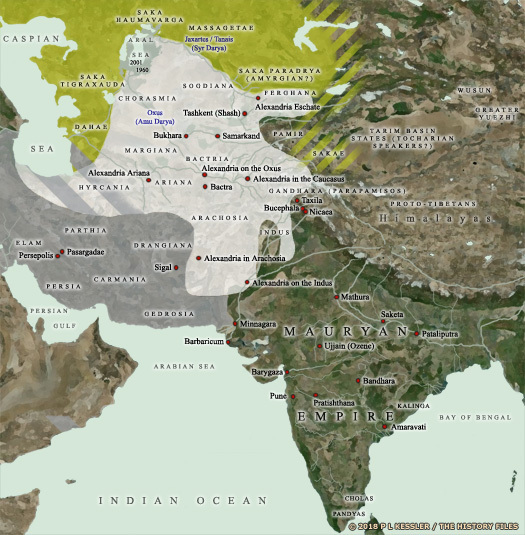 The hostile Xiongnu already occupy at least part of these lands even though, during this period, the Greater Yuezhi are the most powerful nomadic group on the north-western Chinese plains. The neighbouring Wusun have migrated with the Greater Yuezhi from the Dunhuang/Qilian region and now occupy lands to the north-west of them. 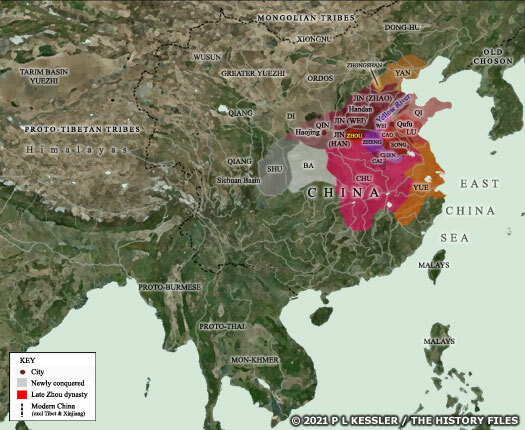 The Qin conquer the Yen/Yan, who have also ruled the Korean kingdom of Chosen for the past eighty-odd years. The Korean state remains a possession of Wang Chêng's for the remainder of his lifetime. The 'Warring States' period comes to an end as the Qin conquer the last remaining rival kingdoms and unify the Yellow Plain, and therefore ancient China. King Wang Chêng of Qin adopts the throne name of Emperor Shi Huangdi of the Qin dynasty and begins to create a very different China from the smaller unified kingdom of ancient times.